Welcome to the Device Control Protocol (DCP), designed for the "Internet of Things" - interfacing everyday devices over networks. This online reference is everything you will need to learn more and get started using the protocol. It includes a complete hyperlinked specification and an XML Document Type Definition for controlling "things" and exchanging data between devices. The Device Control Protocol (DCP) is an application level protocol optimized for the integration, monitoring and control of devices or "things" on a network. It provides a framework for integrating unconventional network devices attached to networks directly, wirelessly or as computer periphery. DCP is a generic, object-oriented protocol which supports connection and connectionless communication between resources. It employs an open ended set of methods for indicating the purpose of a request and builds on the discipline of reference provided by the Uniform Resource Identifier (URI), for indicating the object to which these methods are to be applied. By the typing and negotiation of device data representation, DCP allows applications and devices to be built independently of data representation while maintaining interoperability. It defines an extensible object model that enables the developer to expose objects, properties, methods, and events of a device. Plug-and-play characteristics may be implemented for devices through the reserved user interface and device driver objects. The Device Control Protocol has been designed to provide a natural and comfortable extension of the Internet to "things." This reference assumes knowledge of the Transmission Control Protocol (TCP), the Universal Datagram Protocol (UDP), TCP/IP communications, and Object Oriented Programming (OOP). The Device Control Protocol Reference includes the following features. The DCP Specification is a protocol standard, similar to an Internet RFC, which makes developing devices and applications that leverage this Internet-based device control technology simple. It is a complete hyperlinked reference to the protocol. The DCP XML DTD is an Extensible Markup Language Document Type Definition for DCP. It is a hierarchical markup language that can be used to represent device states, properties and events. Device object models may also be described with the DCP XML DTD. The architecture of DCP exhibits the abstraction of device data from the protocol itself. As such, use of this DTD with DCP is not required. All that is required is that the recipient of the representation be able to understand and process it. For your reference, the XML DTD is available here should you wish to use it. DCP is a protocol designed for communication with and between network devices. While the File Transfer Protocol (FTP) was designed for transferring files and the Hypertext Transfer Protocol (HTTP) emphasizes the transfer of media, DCP focuses on controlling and monitoring devices connected to the Internet. In the context of DCP, a device is any resource attached to a network and is not necessarily a terminal or network infrastructure equipment. DCP is a protocol for controlling network devices and should not be compared with DCOM and CORBA, which are binary standards for network components. DCP addresses the increasing demand for integrating non-traditional network devices by specifying a common language for devices to interoperate with each other, as well as Internet applications. It provides a protocol standard for devices that embed Internet technology and connect to networks directly in addition to devices that connect to networks as computer periphery. The Device Control Protocol is a generic, object-oriented protocol which employs a session / transaction paradigm that may be implemented on both connection and connectionless communication between resources. The object-oriented features of DCP allow the protocol to be easily applied to real world objects, or devices. Since the protocol supports both connection and connectionless communication, it offers facilities for reliable and secure communication, as well as broadcast and light-weight messaging. DCP is extensible and leverages existing Internet technology and standards. It employs an open-ended set of methods for indicating the purpose of a transaction request, allowing expansion methods to be added. The Device Control Protocol builds on the discipline of reference provided by the Uniform Resource Identifier (URI), for indicating the object to which methods are to be applied. DCP extends URIs to include objects, properties, methods and events in a style that object oriented programmers are used to. Although an XML document type definition for device data has been defined, use of the representation with DCP is not required. All that is required is that the recipient of the representation be able to understand and process it. The architecture of DCP exhibits the abstraction of device data from the protocol itself. By the typing and negotiation of device data representation, DCP allows applications and devices to be built independently of data representation while maintaining interoperability. This allows for the expansion of data representation types without changing the protocol, allowing developers to separate the transfer of data from the data itself. Since DCP negotiates device data representation, multiple representation types may be supported with ease. DCP further extends it capabilities through a collection of reserved objects. Developers may expose properties, methods, and events of device through a reserved object model object. This allows applications and other devices to query and browse the capabilities of a device. Plug and play characteristics may be implemented for DCP aware devices through the reserved user interface and device driver objects. This allows user interfaces and device drivers to be embedded inside devices. These reserved objects only specify exposition, negotiation and transfer of the objects. Although the devices may be implemented with DCP, the technology chosen is at the discretion of the developer. DCP provides a natural and comfortable extension of the Internet to devices. It has been designed to leverage the massive infrastructure, huge physical network, and large embedded base of software standards and knowledge associated with the Internet. It is also designed to offer an object-oriented approach to embedding the Internet in devices. The result is a powerful, extensible protocol that allows developers to seamlessly connect devices to the Internet in a comfortable and simple fashion. This resource uses a number of terms to refer to roles played by participants in and objects of DCP communication. Several new terms and new contexts for existing terms are introduced. It is recommended that even the seasoned Internet developer review the terms before proceeding to other areas of this reference. Application - a program or process attached to a network that is capable of DCP communication. Throughout this reference, the terms "application", "device" and "resource" are used interchangeably. Client - a network resource that issues requests to a server. In typical client/server environments, resources usually play one role or the other. This is not the case for DCP. In DCP, devices typically play roles as both clients and servers by issuing requests to other devices and servicing requests from other devices. To avoid confusion in this resource, the term client will not be used when making reference to a DCP transaction. Instead, the device initiating a transaction will be referred to as the initiator. The term initiator is intended to only be used in the context of the DCP transaction that it is associated with. Connection - a transport layer virtual circuit established between two network resources for the purpose of communication. In DCP, when the mode of service is connection-oriented, the initiator establishes a connection with the target before making a request. Device - a piece of physical equipment attached to a network that is capable of DCP communication. A device is not limited to traditional network hardware (like terminals, switches and routers), but it includes unconventional network devices (like security systems, environmental control systems and factory machinery). Throughout this reference, the terms "device", "application" and "resource" are used interchangeably. Entity - a particular representation or rendition of device data that may be enclosed within a request or response message. An entity consists of meta-information in the form of entity headers and content in the form of an entity body. Host - any resource on a network that provides services of any kind to other resources on the network and is qualified by a valid Internet host name or IP address. Initiator - refers to the device or application that initiates or starts a transaction with another DCP resource (the target). In both open-loop and closed-loop transactions, the initiator is the resource that initiates the transaction by making a DCP request and the target is the resource that processes it. In a client/server model, resources usually play a single messaging or processing role. This is not the case for DCP, so the term client will not be used in this reference to avoid confusion. Instead, the term initiator will be used and carry the meaning described above. Since most DCP devices play multiple roles, the term initiator only has meaning in the context of the transaction that it refers to. Message - the basic unit of DCP communication and consists of a structured sequence of octets matching the syntax defined in this resource and transmitted via a connection or datagram. DCP transactions are made up of messages. In DCP there are two types of messages, requests and responses. DCP Messages have request or response lines, headers and bodies. Mode of Service (MOS) - the method used by a network to provide communication services between two processes. In short, a mode of service specifies how a communication layer performs an operation. DCP makes reference to two modes of service, connection-oriented and connectionless. Connection-oriented services create a virtual circuit, which gives the illusion of a physical communication path or point-to-point connection. To an application using a connection oriented mode of service, the communication channel appears to be a solid, unbroken path for communication. A connection-oriented mode of service is similar to telephone communication. A connectionless mode of service provides communication in the form of a delivery service. In other words, a connectionless mode of service does not establish a point-to-point connection. There is no illusion of a solid, unbroken communication path. Communication takes place as a series of datagrams that are delivered by the network through potentially different paths and at varying rates. Object Model - a hierarchical object oriented structure that describes a resource's properties, methods and events. It contains all the information necessary for having a DCP conversation with a resource. An object model may be used to expose the accessible characteristics of a resource. Request -a DCP request message. DCP transactions are initiated by a request message being sent from the initiator to the target. Resource - a device, application program or process attached to a network that is capable of DCP communication. Throughout this reference, the terms "resource", "device" and "application" are used interchangeably. Response - a DCP response message. DCP closed-loop transactions are completed by a response message being sent from the target to the initiator. Server - a network resource that services requests from a client. In typical client/server environments, resources usually play one role or the other. This is not the case for DCP. In DCP, devices typically play roles as both clients and servers by initiating transactions with other devices and processing transactions started by other devices. To avoid confusion in this resource, the term server will not be used. Instead, the device servicing a transaction will be referred to as the target. This term is intended to only be used in the context of the DCP transaction that it is associated with. Session - a DCP conversation between two devices. Once a session is opened, any combination of DCP transactions may take place. Sessions apply to both connection-oriented and connectionless modes of service and should not be considered the same as a connection. Sessions are identified by a session ID, not a TCP connection. Target - a resource that processes a DCP transaction initiated by another resource, known as the initiator. In both open-loop and closed-loop transactions, the target processes transactions. The target completes closed-loop transactions by sending a response message to the initiator. In a client/server model, resources usually play a single messaging or processing role. Since this is not the case for DCP, the term server will not be used in this reference to avoid confusion. Instead, the term target will be used and carry the meaning described above. Since most DCP devices play multiple roles, the term target only has meaning in the context of the transaction that it refers to. Tether - a feature of DCP communication that allows a resource to bind itself to a property of another resource. The DCP tether facilitates a continuous (as opposed to event driven) stream of property data from the target to the initiator. Transaction - a piece of DCP communication that occurs within a session. Many transactions can occur within a single session. Transactions may be of an open-loop or closed-loop nature. Open-loop transactions consist of a DCP request message that is sent from an initiator to a target and the processing performed by the target to satisfy the request. Closed-loop transactions are identical to open-loop transactions except that they also include a DCP response message sent from the target to the initiator to acknowledge the request and return device data when appropriate. An initiator resource opens a DCP session with a target resource. Any number of DCP transactions are performed within the session by either party. The DCP session is closed. DCP sessions and transactions can be compared to a conversation between people. A session is like an entire conversation and transactions are like statements (or questions and answers). Just as many statements are made by both parties in a conversation, many transactions can be made by both participants in a single DCP session. Open-loop transactions are one-way communication scenarios that are initiated by one resource and processed by another. They do not include a response. A closed-loop transaction is a two-way communication scenario that, in addition to the message that initiates the transaction, includes a response. DCP devices are likely to initiate and process both open-loop and closed-loop transactions. In both open-loop and closed-loop transactions, a request is sent from an initiator resource to a target resource in the form of a request method, URI and protocol version followed by headers and a MIME-like message with possible body content. For closed-loop transactions, a response follows in the form of a status line, including a protocol version and status code followed by headers and a MIME-like message with possible body content. Message headers are used to communicate and negotiate content representation of the body, permitting DCP applications and devices to be built independently of data representation while maintaining interoperability. All mechanisms in this reference are specified in both prose and an augmented Bakus-Naur Form (BNF) similar to that used by Internet RFC 822. Implementers of DCP will need to be familiar with the BNF notation in order to understand this reference. For convenience, this resource includes an overview of BNF that is sufficient for comprehending the DCP specification. name = definition : The name of a rule is simply the name itself (without any enclosing "<" and ">") and is separated from its definition by the equal character "=". White space is only significant in that indentation of continuation lines is used to indicate a rule definition that spans more than one line. Certain basic rules are in a special style, such as sp, lws, ht, crlf, etc. Angle brackets are used within definitions whenever their presence will facilitate discerning the use of rule names. Note: Contrary to some RFCs, this specification does not represent basic rules in all uppercase letters. Rather, a special style is used as indicated above. "literal" : Quotation marks surround literal text. Unless stated otherwise, the text is case-insensitive. rule1 | rule2 : Elements separated by a bar ("|") are alternatives, e.g., "yes | no" will accept yes or no. (rule1 rule2) : Elements enclosed in parentheses are treated as a single element. Thus, "(elem (foo | bar) elem)" allows the token sequences "elem foo elem" and "elem bar elem". *rule : The character "*" preceding an element indicates repetition. The full form is "<n>*<m>element" indicating at least <n> and at most <m> occurrences of element. Default values are 0 and infinity so that "*(element)" allows any number, including zero; "1*element" requires at least one; and "1*2element" allows one or two. [rule] : Square brackets enclose optional elements; "[foo bar]" is equivalent to "*1(foo bar)". n rule : Specific repetition: "<n>(element)" is equivalent to "<n>*<n>(element)"; that is, exactly <n> occurrences of (element). Thus 2digit is a 2-digit number, and 3alpha is a string of three alphabetic characters. #rule : A construct "#" is defined, similar to "*", for defining lists of elements. The full form is "<n>#<m>element" indicating at least <n> and at most <m> elements, each separated by one or more commas (",") and optional linear white space (lws). This makes the usual form of lists very easy; a rule such as "( *lws element *( *lws "," *lws element ))" can be shown as "1#element". Wherever this construct is used, null elements are allowed, but do not contribute to the count of elements present. That is, "(element), , (element)" is permitted, but counts as only two elements. Therefore, where at least one element is required, at least one non-null element must be present. Default values are 0 and infinity so that "#(element)" allows any number, including zero; "1#element" requires at least one; and "1#2element" allows one or two. ; comment : A semi-colon below, above or set off some distance to the right of rule text, starts a comment that continues to the end of line. This is a simple way of including useful notes in parallel with the specifications. Note: This reference also includes comments in the same style as this paragraph preceded by "Note:" in this font-face and color rather than using the ";" indicator. implied *lws : The grammar described by this specification is word-based. Except where noted otherwise, linear white space (lws) can be included between any two adjacent words (token or quotedString), and between adjacent tokens and delimiters (tSpecials), without changing the interpretation of a field. At least one delimiter (tSpecials) must exist between any two tokens, since they would otherwise be interpreted as a single token. However, applications should attempt to follow "common form" when generating DCP constructs. The following rules are used throughout this specification to describe basic parsing constructs. The US-ASCII coded character set is defined by ANSI X3.4-1986. Note: DCP defines the octet sequence cr lf as the end-of-line marker for all protocol elements except the entity body. The end-of-line marker within an entity body is defined by its associated media type. Note: DCP headers may be folded onto multiple lines if each continuation line begins with a space or horizontal tab. All linear white space, including folding, has the same semantics as sp. However, folding of header lines is not expected by some applications, and should not be generated by DCP applications. Note: The text rule is only used for descriptive field contents and values that are not intended to be interpreted by the message parser. Words of *text may contain octets from character sets other than US-ASCII. Recipients of header field text containing octets outside the US-ASCII character set may assume that they represent ISO-8859-1 characters. Note: Many DCP header field values consist of words separated by lws or special characters. These special characters must be in a quotedString to be used within a parameter value. comment = "(" *( cText | comment ) ")"
Note: Comments may be included in some DCP header fields by surrounding the comment text with parentheses. Comments are only allowed in fields containing "comment" as part of their field value definition. In all other fields, parentheses are considered part of the field value. Note: A string of text is parsed as a single word if it is quoted using double-quote marks. Note: Single-character quoting using the backslash ("\") character is not permitted in DCP. The implementation of DCP involves various protocol parameters. These include protocol versions, uniform resource identifiers, character sets, content codings, media types and product tokens. They will be described in this section. DCP uses a "<major>.<minor>" numbering scheme to indicate versions of the protocol. The protocol versioning policy is intended to allow the sender to indicate the format of a message and its capacity for understanding further DCP communication, rather than the features obtained via that communication. No change is made to the version number for the addition of message components which do not affect communication behavior or which only add to extensible field values. The <minor> number is incremented when the changes made to the protocol add features which do not change the general message parsing algorithm, but which may add to the message semantics and imply additional capabilities of the sender. The <major> number is incremented when the format of a message within the protocol is changed. The version of a DCP message is indicated by a dcpVersion field in the first line of the message. If the protocol version is not specified, the recipient must assume that the message is in the DCP/1.0 format. Note that the major and minor numbers should be treated as separate integers and that each may be incremented higher than a single digit. Thus, DCP/2.4 is a lower version than DCP/2.13, which in turn is lower than DCP/12.3. Leading zeros should be ignored by recipients and never generated by senders. This reference defines the 1.0 version of the DCP protocol. DCP applications must include a dcpVersion of "DCP/1.0". respond appropriately with a message in the same protocol version used by the initiator if a response is required. understand any valid response in the format of DCP/1.0. Proxy and gateway applications must be careful in forwarding requests that are received in a format different than that of the application's native DCP version. Since the protocol version indicates the protocol capability of the sender, a proxy/gateway must never send a message with a version indicator that is greater than its native version. If a higher version request is received, the proxy/gateway must either downgrade the request version or respond with an error. Requests with a version lower than that of the application's native format may be upgraded before being forwarded; the proxy/gateway's response to that request must follow the server requirements listed above. URIs have been known by many names: WWW addresses, Universal Document Identifiers, Universal Resource Identifiers, and finally the combination of Uniform Resource Locators (URL) and Names (URN). URIs are simply formatted strings which identify, via name, location, object instance, property, method, event or any other characteristic, a network resource. For Internet access protocols, it is necessary in most cases to define the encoding of the access algorithm into something concise enough to be termed address. URIs which refer to objects accessed via a specific Internet protocol, such as DCP, are known as Uniform Resource Locators (URLs). URIs in DCP can be represented in absolute form or relative to some known base URI, depending upon the context of their use. The two forms are differentiated by the fact that absolute URIs always begin with a scheme name followed by a colon. For definitive information on URL syntax and semantics, see RFC 1738 and RFC 1808. The BNF above includes national characters not allowed in valid URLs as specified by RFC 1738, since DCP resources are not restricted in the set of unreserved characters allowed to represent the relPath part of addresses, and DCP proxies may receive requests for URIs not defined by RFC 1738. The "DCP" scheme is used to locate network resources via the DCP protocol. This section defines the scheme-specific syntax and semantics for DCP URLs. dcpScheme = "dcp" | "dcpu" | "dcps"
Note: The scheme "dcp" requires that commands are issued via a reliable or connection-oriented protocol (within the Internet, TCP), while the scheme "dcpu" identifies an unreliable or connectionless protocol (within the Internet, UDP). The scheme "dcps" indicates that a TCP connection secured by TLS must be used. Note: An object is an exposed resource of a host or parent object that can have properties, methods, events and child objects. Note: A handle is a set of instantiation properties pertaining to an object that specifies the instance of the object. Note: A property is one piece of object data exposed by the object model that may be read and optionally written. Objects may have many properties. method = 1*( alpha | digit ) "(" [argList] ")"
Note: A method is a process that may be invoked and applied against the object of which it is a member. Objects may have many methods. Note: An event is the occurrence of a meaningful predefined device incident. Objects may have many events. If the port is empty or not given, port 2500 is assumed. The semantics are that the identified resource is located at the target listening for TCP connections and UDP messages on that port of that host, and the dcpRequestUri for the resource is absDcpPath. If the absDcpPath is not present in the URL, it must be given as "/" when used as a dcpRequestUri. Note: Although the DCP protocol is independent of the transport layer protocol, the DCP URL only identifies resources by their TCP location, and thus non-TCP resources must be identified by some other URI scheme. The canonical form for "DCP" URLs is obtained by converting any upAlpha characters in host to their loAlpha equivalent (hostnames are case-insensitive), eliding the [ ":" port] if the port is 2500, and replacing an empty absDcpPath with "/". DCP/1.0 applications allow three different formats for the representation of date/time stamps: RFC 1123 Date, RFC 850 Date and ANSI C Time Date. The first format is preferred as an Internet standard and represents a fixed-length subset of that defined by RFC 1123. The second format is in common use, but is based on the obsolete RFC 850 date format and lacks a four-digit year. DCP/1.0 initiators and targets that parse the date value should accept all three formats, though they must never generate the third (ANSI C) format. Note: Recipients of date values are encouraged to be robust in accepting date values that may have been generated by non-DCP applications. All DCP/1.0 date/time stamps must be represented in Universal Time (UT), also known as Greenwich Mean Time (GMT), without exception. This is indicated in the first two formats by the inclusion of "GMT" as the three-letter abbreviation for time zone, and should be assumed when reading the ANSI C format. rfc1123Date = wkDay "," sp date1 sp time sp "GMT"
rfc850Date = weekDay "," sp date2 sp time sp "GMT"
wkDay = "Mon" | "Tue" | "Wed" | "Thu" | "Fri" | "Sat" | "Sun"
weekDay "Monday" | "Tuesday" | "Wednesday" | "Thursday" | "Friday" | "Saturday" | "Sunday"
month "Jan" | "Feb" | "Mar" | "Apr" | "May" | "Jun" | "Jul" | "Aug" | "Sep" | "Oct" | "Nov" | "Dec"
Note: DCP requirements for the date/time stamp format apply only to their usage within the protocol stream. Initiators and targets are not required to use these formats for user presentation, request logging, etc. DCP uses the same definition of the term "character set" as that described for MIME. The term "character set" is used in this reference to refer to a method used with one or more tables to convert a sequence of octets into a sequence of characters. Note that unconditional conversion in the other direction is not required, in that not all characters may be available in a given character set and a character set may provide more than one sequence of octets to represent a particular character. This definition is intended to allow various types of character encodings, from simple single-table mappings such as US-ASCII to complex table switching methods such as those that use ISO 2022's techniques. However, the definition associated with a MIME character set name must fully specify the mapping to be performed from octets to characters. In particular, use of external profiling information to determine the exact mapping is not permitted. Note: This use of the term "character set" is more commonly referred to as a "character encoding." However, DCP shares the same terminology as MIME. DCP character sets are identified by case-insensitive tokens. The IANA Character Set registry defines the complete set of tokens. However, because that registry does not define a single, consistent token for each character set, the DCP preferred names for those character sets most likely to be used with DCP entities are defined here. These character sets include those registered by RFC 1521 (the US-ASCII and ISO-8859 character sets) and other names specifically recommended for use within MIME charSet parameters. Although DCP allows an arbitrary token to be used as a charSet value, any token that has a predefined value within the IANA Character Set registry must represent the character set defined by that registry. Applications should limit their use of character sets to those defined by the IANA registry. The character set of an entity body should be labeled as the lowest common denominator of the character codes used within that body, with the exception that no label is preferred over the labels US-ASCII or ISO-8859-1. Content coding values are used to indicate an encoding transformation that has been applied to a resource data. Content codings are primarily used to allow information to be compressed or encrypted without losing the identity of its underlying media type. Note: DCP applications should consider "gzip" and "compress" to be equivalent to "x-gzip" and "x-compress", respectively. All content-coding values are case-insensitive. DCP uses contentCoding values in the Content-Encoding header field. Although the value describes the content-coding, what is more important is that it indicates what decoding mechanism will be required to remove the encoding. Note that a single program may be capable of decoding multiple content-coding formats. Values specified by this reference are defined below. x-gzip - an encoding format produced by the file compression program "gzip" (GNU zip) developed by Jean-loup Gailly. This format is typically a Lempel-Ziv coding (LZ77) with a 32 bit CRC. x-compress - The encoding format produced by the file compression program "compress". This format is an adaptive Lempel-Ziv-Welch coding (LZW). Note: Use of program names for the identification of encoding formats is not desirable and should be discouraged for future encodings. Their use here is representative of historical practice, not good design. DCP uses Internet Media Types in the Content-Type header field in order to provide open and extensible data typing. The mainType, subType, and pAttribute terms are case-insensitive. The pValue term may or may not be case-sensitive, depending on the semantics of the parameter name. lws must not be generated between the mainType and subType, or between a pAttribute and its pValue. Upon receipt of a mediaType with an unrecognized pAttribute, the mediaType should be treated as if the unrecognized pAttribute and its pValue were not present. Note: Media type values are registered with the Internet Assigned Number Authority (IANA). The media type registration process is outlined in RFC 1590. Use of non-registered media types is discouraged. Internet media types are registered with a canonical form. In general, an entity body transferred via DCP must be represented in the appropriate canonical form prior to its transmission. If the body has been encoded with a content encoding, the underlying data should be in canonical form prior to being encoded. Media subTypes of the "text" type use crlf as the text line break when in canonical form. However, DCP allows the transport of text media with plain cr or lf alone representing a line break when used consistently within the entity body. DCP applications must accept crlf, bare cr, and bare lf as being representative of a line break in text media received via DCP. In addition, if the text media is represented in a character set that does not use octets 13 and 10 for cr and lf respectively, as is the case for some multi-byte character sets, DCP allows the use of whatever octet sequences are defined by that character set to represent the equivalent of cr and lf for line breaks. This flexibility regarding line breaks applies only to text media in the entity body; a bare cr or lf should not be substituted for crlf within any of the DCP control structures (such as header fields and multipart boundaries). The "charset" parameter is used with some media types to define the character set of the data. When the sender provides no explicit charset parameter, media subTypes of the "text" type are defined to have a default charset value of "ISO-8859-1" when received via DCP. Data in character sets other than "ISO-8859-1" or its subsets must be labeled with an appropriate charset value in order to be consistently interpreted by the recipient. MIME provides for a number of "multipart" types (encapsulations of several entities within a single message's entity body). The multipart types registered by IANA do not have any special meaning for DCP, though resources may need to understand each type in order to correctly interpret the purpose of each body part. DCP resources should follow the same or similar behavior as a MIME user agent does upon receipt of a multipart type. DCP resources should not assume that other DCP resources are prepared to handle multipart types. All multipart types share a common syntax and must include a boundary parameter as part of the mediaType value. The message body is itself a protocol element and must therefore use only crlf to represent line breaks between body parts. Multipart body parts may contain DCP header fields which are significant to the meaning of that part. Product tokens are used to allow communicating resources to identify themselves via a simple product token, with an optional slash and version (or model) designator. Most fields using product tokens also allow sub-products which form a significant part of the application to be listed, separated by white space. By convention, the products are listed in order of their significance for identifying the resource. Product tokens should be short and to the point (use of them for advertising or other non-essential information is explicitly forbidden). Although any token character may appear in a productVersion, this token should only be used for a version identifier (i.e., successive versions of the same product should only differ in the productVersion portion of the product value). Like any application layer protocol or service, DCP resides on top of and depends on transport layer services for lower-level messaging. Transport layer services may be categorized as either connectionless or connection-oriented. To provide flexibility and extensibility, DCP communication has been designed to take place over both connectionless and connection-oriented modes of service (MOS) on the transport layer. A connection-oriented MOS creates a virtual circuit, which gives the illusion of a physical communication path. It is a connection that appears to be point-to-point in nature. A connection-oriented MOS is similar to a telephone conversation: the parties establish a connection, maintain the connection through the duration of their interaction and then terminate the connection. For DCP, the virtual circuit remains intact through the duration of transactions and, optionally, through the lives of sessions. Handshaking takes place within the transport layer to guarantee the delivery of messages. An advantage of connection-oriented MOS is the reliability provided by the transport layer in message delivery. However, this is at the expense of greater associated overhead within the transport layer . When guaranteed message deliver is desired, a connection-oriented MOS is preferred. A connectionless MOS provides communication in the form of a delivery service. It does not establish a point-to-point connection. Since no form of connection is established between the parties, the transport layer services do not guarantee delivery. A connectionless MOS can be compared to using a courier service: the parties do not establish a connection, rather they communicate by sending each other messages via the service. Although there is no virtual circuit or guaranteed message delivery, DCP initiators and targets maintain state (or keep track of messages and of each other) through the use of session and transaction identifiers (similar to how couriers use tracking numbers). Advantages of connectionless MOS include the ability to broadcast messages to the network at large and less associated transport layer overhead. However, this sacrifices a transport that guarantees delivery. Connectionless MOS is generally preferred when guaranteed message delivery is not required and light-weight or broadcast messaging is desired. Note: Although a connectionless MOS does not provide guaranteed delivery within the transport layer, DCP provides a set of robust facilities for tracking messages which allow a guaranteed delivery service to be implemented within the DCP application layer. DCP employs UDP and TCP transport protocols for connectionless MOS and connection-oriented MOS respectively. The default port is 2500, but other ports may be used. This does not preclude DCP from being implemented on top of other protocols on the Internet, or on other networks. DCP only presumes transport layers that provide connection-oriented MOS and connectionless MOS. The mapping of the DCP message structures onto the transport data units of other protocols is outside the scope of this reference. Note: The DCP URL dcpScheme for connection-oriented MOS includes "dcp" (indicates TCP transport) and "dcps" (indicates TCP secured by TLS). The DCP URL dcpScheme for connectionless MOS is "dcpu" (indicates UDP transport). A DCP session with a target device is opened. Any number of DCP transactions are made within the session. Less header data, because data that is pertinent to a session only needs to be sent once (when the session is created) rather than with each transaction, resulting in greater speed and less traffic. Convenience of "pipelining" transactions through the session. A facility for hosting tethers and managing groups of transactions; when a session is closed, all pending transactions and tethers should be closed as well. Sessions apply to both connection-oriented and connectionless modes of service and should not be considered the same as a transport layer connection. Sessions are identified by the Session-ID header assigned by either resource when the DCP conversation is first started and may span multiple transport layer connections or datagrams. All transactions that take place within the session must carry the session ID with them in the header data. This provides a way of grouping transactions together and keeping track of them. The DCP session provides implementation flexibility and allows the features of DCP to be supported in both connection-oriented and connectionless modes of service without degrading its capabilities. DCP makes use of special request header fields and response status codes for managing sessions. Sessions may be managed explicitly and implicitly, friendly and unfriendly, and as an initiator or as a target. The Session and Session-ID request message headers are used in conjunction with the 202 Keep-Alive and 203 Release response status codes to open and close sessions. These message headers and response codes may be used within any transaction. For DCP transactions that are initiated outside the scope of a session, the target must create a session and establish a Session ID before processing the transaction. Detailed semantics for managing sessions are provided later in this reference. Open-loop transactions are one-way communication scenarios that are initiated by one resource and processed by another. They do not include a response. This is similar to sending a check off in the mail and not receiving a receipt for it -- the sales loop is left open. A closed-loop transaction is a two-way communication scenario that, in addition to the message that initiates the transaction, includes a response. This is similar to writing a check for something at the store -- you get a receipt and the sales loop is closed. Although both types of transactions may be implemented in either mode of service, connectionless modes of service allow transactions to be sent to the network at large. With the exception of discover requests, the default behavior for requests sent to the entire network is that they are open-loop transactions and should not be responded to. Discover requests (which are always broadcast to a network) should always be treated as closed-loop transactions and should result in a response. The default behavior for requests sent to specific hosts is that they are closed-loop transactions and should result in a response. Through the use of the Transaction-Type request header, default behavior can be over-ridden. Unlike the ubiquitous client/server model, the DCP model for communication results in resources that play more than one messaging role. DCP devices are likely to initiate and process both open-loop and closed-loop transactions. Open-loop transactions should be used when a response is optional and it is unimportant to ensure that any specific resource processed the message. One application for the open-loop transaction is to notify other devices when a minor device event occurs. In a connectionless mode of service, these transactions may be sent to the whole network, notifying all DCP devices of an event. If a response is needed or an acknowledgement of processing is desired, then the closed-loop transaction should be used. Example applications for this type of transaction include querying or setting a device property, calling a device method, and sending critical event messages. The basic building blocks of transactions are DCP messages. They will be discussed later in the DCP Message section. DCP messages are the basic building blocks of DCP communication. DCP messages build the transactions which make up DCP sessions. In DCP, there are different types of messages and they are made up of request lines, status (or response) lines, headers and bodies. The DCP messages consist of requests from initiators to targets and responses from targets to initiators. DCP message headers are attribute and value pairs embedded within messages that are used to convey information about the message, initiators, targets and desired behavior. DCP header fields follow the same generic format as that given in Section 3.1 of RFC 822. Each header field consists of a name followed immediately by a colon (":"), a single space (sp) character, and the field value. Field names are case-insensitive. Header fields can be extended over multiple lines by preceding each extra line with at least one sp or ht, though this is not recommended. The order in which header fields are received is not significant. However, it is "good practice" to send general header fields first, followed by DCP headers (request and response headers) and entity header fields. Multiple DCP header fields with the same fieldName may be present in a message if and only if the entire fieldValue for that header field is defined as a comma separated list. It must be possible to combine the multiple header fields into one "fieldName: fieldValue pair, without changing the semantics of the message, by appending each subsequent fieldValue to the first, each separated by a comma. There are a few header fields which have general applicability for both request and response messages, but which do not apply to the entity being transferred. These header fields apply only to the message being transmitted and they are referred to as general headers. The DCP request line is the first part of a request message. It includes an optional method operator, request method, URI and DCP version. The semantics for the request line follow. The request method operator is used to enhance the behavior of a request method. The presence of an exclamation mark "!" in the first token of a request line indicates that the set of characters to the left of the exclamation mark forms a method operator. This operator is applied against the request method that follows the exclamation mark and modifies the normal behavior of the request method. The DCP request method is used to indicate the purpose of a request. It is applied to the resource referenced by the DCP request URI in the request line. The DCP request indicates the resource to which the request method in the request line are to be applied. The DCP request URI is a Uniform Resource Identifier that has been extended to support devices modeled as objects. The two options for request URI are dependent on the nature of the request. The dcpUrl form is only allowed when the request is being made to a proxy (or intermediary). The proxy is requested to forward the request and return the response. The proxy may forward the request on to another proxy or directly to the target specified by the dcpUrl. In order to avoid request loops, a proxy must be able to recognize all of its target names, including any aliases, local variations, and the numeric IP address. The most common form of the DCP request URI is that used to identify a resource on a target. In this case, only the absDcpPath of the URI is transmitted. Note: The absDcpPath cannot be empty; if none is present in the original URI, it must be given as "/" (the target root). The DCP request URI is transmitted as an encoded string, where some characters may be escaped using the ' "%" hex hex ' encoding defined by RFC 1738. The target must decode the DCP request URI to properly interpret the request. Request header fields allow the initiator to pass additional information about the request, and about the initiator itself, to the target. These fields act as request modifiers, with semantics equivalent to the parameters on a programming language method (procedure) invocation. Request header field names can be extended reliably only in combination with a change in the protocol version. However, new or experimental header fields may be given the semantics of request header fields if all parties in the communication recognize them to be request header fields. Unrecognized header fields are treated as entity header fields. After receiving and interpreting a request message for a closed-loop transaction, a target responds in the form of one or multiple DCP response messages. The information sent in a response is dependent on the request method. Note: Targets should not respond to requests that are made as part of open-loop transactions. The first line of a response message is the status line, consisting of the protocol version followed by a numeric status code and its associated textual phrase, with each element separated by sp characters. No cr or lf is allowed except in the final crlf sequence. The status code element of a reponse status line is a 3 digit integer result code of the attempt to understand and satisfy the request. The status code is intended for use by automata. The first digit of the status code defines the class of response. The last two digits do not have any categorization role. Not used, but reserved for future use. The target failed to fulfill an apparently valid request. The individual values of the numeric status codes defined for DCP and status code semantics are presented below. DCP status codes are extensible. DCP applications are not required to understand the meaning of all registered status codes, though such understanding is obviously desirable. However, applications must understand the class of any status code, as indicated by the first digit, and treat any unrecognized response as being equivalent to the x00 status code of that class. For example, if an unrecognized status code of 431 is received by the initiator, it can safely assume that there was something wrong with its request and treat the response as if it had received a 400 status code. In such cases, initiator agents should present to the user the entity returned with the response, since that entity is likely to include human-readable information which will explain the unusual status. The reason phrase of a response status line is intended to give a short textual description of the status code. The initiator is not required to examine or display the reason phrase. The semantics for the reason phrase follow. A set of recommended reason phrases is presented below. 202 = "OK, Keep Alive"
405 = "Method Not Allowed"
500 = "Internal Target Error"
Note: Since the reason phrases listed here are only suggested, they may be replaced by local equivalents without affecting the protocol. Response header fields allow the target to pass additional information about the response which cannot be placed in the status line. These header fields give information about the target and about further access to the resource identified by the request URI. Response header field names can be extended reliably only in combination with a change in the protocol version. However, new or experimental header fields may be given the semantics of response header fields if all parties in the communication recognize them to be response header fields. Unrecognized header fields are treated as entity header fields. An entity is a particular representation or rendition of device data that may be enclosed within a request or response message. An entity consists of meta-information in the form of entity headers and (usually) content in the form of an entity body. Entity header fields define optional meta-information about the entity body or, if no body is present, about the resource identified by the request. The content (if any) of an entity takes the form of an entity body. Bodies are sent with requests and responses in a format and encoding defined by entityHeader fields (see entity type and entity length). An entity body is included with a request message only when the request method calls for one. The presence of an entity body in a request is signaled by the inclusion of a contentLength header field in the request message headers. DCP requests containing an entity body must include a valid contentLength header field. For response messages, whether or not an entity body is included with message is dependent on both the request method and the response code. All 1xx (informational) and 300 Not Changed responses must not include a body. All other responses must include an entity body or a contentLength header field defined with a value of zero (0). When an entity body is included with a message, the data type of that body is determined via the header fields contentType and contentEncoding. These define a two-layer, ordered encoding model. The contentType header specifies the media type of the underlying data. A contentEncoding header may be used to indicate any additional content coding applied to the type (usually for the purpose of data compression). The default for the content encoding is none (i.e., the identity function). Any DCP message containing an entity body should include a contentType header field defining the media type of that body. If and only if the media type is not given by a contentType header, the recipient may attempt to guess the media type via inspection of its content and/or the name extension(s) of the URL used to identify the resource. If the media type remains unknown, the recipient should treat it as type "application/octet-stream". When an entity body is included with a message, the length of that body may be determined in one of two ways for connection-oriented MOS. If a contentLength header field is present, its value in bytes represents the length of the entity body. Otherwise, the body length is determined by the closing of the connection by the target for connection-oriented MOS. Since connectionless MOS does not establish a connection, a contentLength header is required for connectionless MOS. Closing a connection-oriented MOS connection cannot be used to indicate the end of a request body, since it leaves no possibility for the target to send back a response. Therefore, DCP requests containing an entity body must include a valid contentLength header field whether they are connection-oriented MOS or connectionless MOS. If a request contains an entity body and content length is not specified, and the target does not recognize or cannot calculate the length from other fields, then the target should send a 400 Bad Request response. The set of common request methods and associated operators for DCP are defined in this section. Although this set can be extended, additional methods and operators cannot be assumed to share the same semantics for separately extended initiators and targets. The definitions that follow describe DCP messages for the transaction and session on both modes of service. When there are any differences in implementation, they will be described in detail. The request method operator is used to enhance the behavior of a request method. The presence of an exclamation mark "!" in the first token of a request line indicates that the set of characters to the left of the exclamation mark forms a method operator. This operator is applied against the request method that follows the exclamation mark. DCP has one pre-defined request method operator: cancel. The cancel operator is used to cancel the processing of a pending or in-process request against the object to which the method is applied. It is at the discretion of the developer to define application behavior for terminating in-process requests. DCP only requires that this method operator cancel requests not yet in process and terminate any tether activity in the same session on the corresponding resource. Note: The termination of a tether should happen only within the session in which the cancel request method operator is initiated. This means that if two separate tethers to the same resource exist in separate sessions when a "cancel tether" request is made against the resource, only the tether that is in the same session as the cancel should be terminated. The DCP request method is used to indicate the purpose of a request. It is applied to the resource referenced by the DCP request URI in the request line. This section defines each of the request methods. The get method may also be applied to an object with no property specified in the request URI. One such application is to return a default property. It is at the discretion of the developer to implement the behavior for such a request. DCP supports reserved objects. They are identified in the request URI by the "*" prefix followed by the name of the reserved object. The get method may be used to request reserved objects. The cancel request method operator may be used on the get method to cancel pending get requests. It is at the discretion of the developer to determine the behavior for requests already in process. The set method is used to modify a property value of the object identified in the request URI. The set request and response should not contain a body. The cancel request method operator may be used on the set method to cancel pending set requests. It is at the discretion of the developer to determine the behavior for requests already in process. The call method is used to invoke a procedure (or method) of the object identified in the request URI. The call request should not contain a body, however an optional returned value for a call request is in the form of an entity body. The cancel request method operator may be used on the call method to cancel pending call requests. It is at the discretion of the developer to determine the behavior for requests already in process. The event method is used to send notification of an initiator object event to the target object identified in the request URI. The event request should contain the event data in the form of an entity body, however the response should not contain a body. Although the cancel request method operator may be used on the event method, it is meaningless. DCP only requires that a valid response be returned. The subscribe method is used to subscribe to the object event identified in the request URI. By subscribing to an object event the initiator is requesting that occurrences of this event on the target object result in notification via an event request method from the target to the initiator. The subscribe request and response should not contain a body. The cancel request method operator may be used on the subscribe method to cancel a subscription to object events. The tether method provides a facility for establishing and terminating a continuous flow, rather than an event driven flow, of information from the target. This allows an initiator to tether to a property on a target, resulting in a continuous feed of property data at the expense of one transaction. The tether request and response should not contain a body. Tethering should persist until the tether is explicitly canceled by the cancel request method operator or the session is terminated. The admin method provides a facility for managing sessions. This allows an initiator to explicitly establish, terminate, expire and keep alive sessions and any supporting connections. The admin request and response should not contain a body. The specific behavior in response to an admin request is dependent on the headers transmitted along with it. Although the cancel request method operator may be used on the admin method, it is meaningless. DCP only requires that a valid response be returned. The discover method provides a mechanism for determining what other DCP-aware devices (if any) are on the network. This is especially useful when a device is turned on for the first time and it is not known what other devices exist. Discover requests are always broadcast to the network or subnet (rather than applied against a specific host) and, hence, must take place on a connectionless mode of service. Transactions broadcast to an entire network, which, by default, are open-loop transactions, must behave as closed-loop transactions for discover requests. All DCP aware devices on a network should respond to discover requests except when there is reason to conceal the presence or identity of a device. The response includes an entity body which specifies the product name, URI and optional device attributes. The cancel request method operator may be used on the discover method to cancel any associated pending responses from devices on the network. Reserved objects are predefined structures that facilitate and standardize the exposition and transfer of a core set of objects that apply to all devices. An asterisk (*) in the request URI indicates that the token that follows is a DCP reserved object. The get method is used to request reserved objects. In the example above, the target device would return it's object model in the entity body of the response. Reserved objects essentially define a way to query any device (known or unknown) for basic information and data. The DCP Object Model is a reserved object which conforms to a hierarchical object-oriented structure that provides a facility for retrieving an objects (or device's) child objects, methods, properties and events. It exposes everything necessary to carry on DCP communication with the device. The object model is returned within the response's entity body with content negotiated prior to transfer. Although an XML document type definition has been defined for the DCP reserved object model, use of the representation with DCP is not required. The reserved object only facilitates the exposition and transfer of the object model. The reserved object model essentially defines a way to query any device (known or unknown) for information regarding its objects, properites, methods and events. The DCP User Interface (UI) object is a reserved object which provides the facility for embedding, exposing and delivering object-specific user interfaces within objects (or devices) themselves. The UI object is returned within the response's entity body with content negotiated prior to transfer. The user interface object may be implemented with whatever technology the developer chooses and does not specify the behavior for user interfaces. The DCP UI object only facilitates the exposition and transfer of the interface. The Documentation object is a reserved object which provides the facility for embedding and delivering object-specific documentation within objects (or devices) themselves. The document object is returned within the response's entity body with content negotiated prior to transfer. The Driver Object is a reserved object which provides the facility for embedding, exposing and delivering software and hardware drivers within objects (or devices) themselves. The driver object is returned within the response's entity body with content negotiated prior to transfer. DCP does not specify the behavior for drivers; it only specifies the exposition and transfer. The driver object may be used to implement plug-and-play behavior. Since content is negotiated prior to transfer, more than one driver may be embedded in a single object allowing for multi-platform support. The various status codes for DCP responses are defined in this section. The status code element of the reponse status line is a 3 digit integer result code of the attempt to understand and satisfy the request. The status code is intended for use by automata. The first digit of the status code defines the class of response. The last two digits do not have any categorization role. Each status code is described in this section. The main classes for status codes are listed below. The 1xx: Informational class of status code indicates a provisional response, consisting only of the status line and optional headers, and is terminated by an empty line. DCP does not define any 1xx status codes and they are not a valid response to a DCP request. However, they may be useful for experimental applications which are outside the scope of this specification. This 2xx: Successful class of status code indicates that the initiators's request was successfully received, understood, and accepted. The 200 status code indicates that the request succeeded. The information returned with the response is dependent on the method used in the request. get : A status line and header information along with an entity corresponding to the requested object property or reserved object are sent in the response. set : The response only contains a status line and header information. Entity bodies should not be sent in the response. call : A status line and header information along with an entity containing the return data of the object method called are sent in the response. event : A status line and header information along with an entity corresponding to the event are sent in the response. subscribe : The response only contains a status line and header information. Entity bodies should not be sent in the response. tether : The response only contains a status line and header information. Entity bodies should not be sent in the response. admin : The response only contains a status line and header information. Entity bodies should not be sent in the response. The 201 status code indicates that the request has been accepted and processing has begun, but has not completed. The purpose of the 201 response is to allow long-running processes to return data to the initiator over multiple responses (and multiple connections on connection-oriented modes of service), and to inform the initiator to expect more responses pertaining to the original request. The 202 status code indicates that the request has been accepted for processing and the session should be kept alive. This should be used in response to requests that contain headers that may indicate a session is terminating when keeping the session alive is desired. The response information sent should conform to the same guidelines as 200 responses. reasonPhrase202 = "OK, Keep Alive"
The 203 status code indicates that the request has been accepted for processing and the session should be released. This should be used in response to requests that contain headers that may indicate a session is terminating when keeping the session alive is not desired. The response information sent should conform to the same guidelines as 200 responses. The 3xx: Redirection class of status code indicates that further action needs to be taken by the initiator agent in order to fulfill the request. The action required may be carried out by the initiator agent without interaction with the user if and only if the method used in the subsequent request is GET or SUBSCRIBE. An initiator agent should never automatically redirect a request more than 5 times, since such redirections usually indicate an infinite loop. The 300 status code indicates that the initiator has performed a conditional get request (see If-Changed-Since) and access is allowed, but the property has not been modified since the date and time specified in the If-Changed-Since header field, the target must respond with this status code and not send an entity body to the initiator. The 301 status code indicates that the target has specified an alternate location for the current session and that any further requests made within the session should be done using the alternate location. This allows the target to specify another port or host for processing the remainder of the session. The alternate location must be given by the location header field. Initiators should automatically re-link references to the alternate location returned by the target. For locations involving alternate hosts, initiator agents should be programmed to obtain confirmation prior to redirection from the initiator when there is a potential for the initiator to expose sensitive information. The 4xx: Initiator Error class of status code is intended for cases in which the initiator seems to have erred. If the initiator has not completed the request when a 4xx code is received, it should immediately cease sending data to the target. The target should include an entity containing an explanation of the error situation, and whether it is a temporary or permanent condition. These status codes are applicable to any request method. Note: If the initiator is sending data, target implementations on connection-oriented MOS (TCP specifically) should be careful to ensure that the initiator acknowledges receipt of the packet(s) containing the response prior to closing the input connection. If the initiator continues sending data to the target after the close, the target's controller will send a reset packet to the initiator, which may erase the initiator 's unacknowledged input buffers before they can be read and interpreted by the DCP application. The 400 status code indicates that the request could not be understood by the target due to malformed syntax. The initiator should not repeat the request without modifications. The 401 status code indicates that the request requires initiator access authentication. The response must include a WWW-Authenticate header field containing a challenge applicable to the requested resource. The initiator may repeat the request with a suitable Authorization header field. If the request already included authorization credentials, then the 401 response indicates that authorization has been refused for those credentials. If the 401 response contains the same challenge as the prior response, and the initiator has already attempted authentication at least once, then the initiator should be presented the entity that was given in the response, since that entity may include relevant diagnostic information. The 402 status code indicates that the request was understood by the target, but the target has refused to process it due to the session ID specified in the request (see the Session-ID header). This may be used when an initiator tries to close a session that does not exist, open a session with an ID that is already in use, or when otherwise valid requests are denied due to the session ID specified. The 403 status code indicates that the request was understood by the target, but the target is refusing to fulfill it. Authorization will not help and the request should not be repeated. If the target wishes to make public why the request has not been fulfilled, it should describe the reason for the refusal in the entity body. This status code is commonly used when the target does not wish to reveal exactly why the request has been refused, or when no other response is applicable. The 404 status code indicates that the target could not find anything matching the request URI. If the target does not wish to make this information available to the initiator, the 403 status code can be used instead. The 405 status code indicates that the request method specified in the request line is not permitted for the resource identified by the request URI. The response must include an Allow header containing a list of valid methods for the requested resource. reasonPhrase405 = "Method Not Allowed"
The 5xx: Target Error class of status codes indicates cases in which the target is aware that it has erred or is incapable of performing the request. If the initiator has not completed the request when a 5xx code is received, it should immediately cease sending data to the target. The target should include an entity containing an explanation of the error situation, and whether it is a temporary or permanent condition. These status codes are applicable to any request method and there are no required header fields. The 500 status code indicates that the target encountered an unexpected condition which prevented it from fulfilling the request. reasonPhrase500 = "Internal Target Error"
The 501 status code indicates the target does not support the functionality required to fulfill the request. This is the appropriate response when the target does not recognize the request method and is not capable of supporting it for any resource. The 503 status code indicates that the target is currently unable to handle the request due to a temporary overloading or maintenance of the target. The implication is that this is a temporary condition which will be alleviated after some delay. Note: The existence of the 503 status code does not imply that a target must use it when becoming overloaded. Some targets may wish to simply refuse the connection. This section defines the syntax and semantics of all standard DCP header fields. For entity header fields, both sender and recipient refer to either the initiator or the target, depending on who sends and who receives the entity. The Accept request header field can be used to specify certain media types which are acceptable for the response. Accept headers can be used to indicate that the request is specifically limited to a small set of desired types. qValue = "0" | "0.1" | "0.2" | "0.3" | "0.4" | "0.5" | "0.6" | "0.7" | "0.8" | "0.9" | "1"
The asterisk "*" character is used to group media types into ranges, with "*/*" indicating all media types and "type/*" indicating all subtypes of that type. The media range may include media type parameters that are applicable to that range. Each media range may be followed by one or more acceptParams, beginning with the "q" parameter for indicating a relative quality factor. The first "q" parameter (if any) separates the mediaRange parameter(s) from the acceptParams. Quality factors allow the initiator to indicate the relative degree of preference for that mediaRange, using the qValue scale from 0 to 1. The default value is "q=1". Example1 should be interpreted as "I prefer audio/basic, but send me any audio type if it is the best available after an 80% mark-down in quality." If no Accept header field is present, then it is assumed that the initiator accepts all media types. If an Accept header field is present, and if the target cannot send a response which is acceptable according to the combined Accept field value, then the target should send a 403 Forbidden response, though sending an unacceptable response is also allowed. Verbally, example 2 would be interpreted as "text/html and text/x-c are the preferred media types, but if they do not exist, then send the text/x-dvi entity, and if that does not exist, send the text/plain entity." Note: An initiator may be provided with a default set of quality values for certain media ranges. However, unless the initiator agent is a closed system which cannot interact with other rendering agents, this default set should be configurable by the user. The Accept-Charset request header field can be used to indicate what character sets are acceptable for the response. This field allows initiators capable of understanding more comprehensive or special- purpose character sets to signal that capability to a target which is capable of representing object data in those character sets. The ISO- 8859-1 character set can be assumed to be acceptable to all user agents. Each charSet may be given an associated quality value which represents the user's preference for that charset. The default value is q=1. If no Accept-Charset header is present, the default is that any character set is acceptable. If an Accept-Charset header is present, and if the target cannot send a response which is acceptable according to the Accept-Charset header, then the target should send an error response with the 403 Forbidden status code, though the sending of an unacceptable response is also allowed. The Accept-Encoding request header field is similar to the Accept header, but restricts the content coding values which are acceptable in the response. If no Accept-Encoding header is present in a request, the target may assume that the initiator will accept any content coding. If an Accept- Encoding header is present, and if the target cannot send a response which is acceptable according to the Accept-Encoding header, then the target should send an error response with the 403 Forbidden status code. An empty Accept-Encoding value indicates none are acceptable. The Accept-Object-Model request header field is used by an initiator while requesting the object model reserved object from a target. This provides content negotiation for the object model object. The field can contain multiple product tokens and comments identifying the object model type. The product tokens are listed in order of their preference. Note: The Accept header field is used to negotiate the media type of the object model and the Accept-Object-Model header field is used for negotiating the object model representation. DCP defines an object model representation, but this does not preclude other representations from being used. The Accept-Object-Model header is used to indicate the representations that the initiator supports. If no Accept-Object-Model header is present, the default is that any representation type of the object model is acceptable with the DCP object model representation being preferred. If an Accept-Object-Model header is present, and if the target cannot send a response which is acceptable according to the Accept-Object-Model header, then the target should send an error response with the 403 Forbidden status code, though the sending of an unacceptable response is also allowed. The Allow entity header field lists the set of methods supported by the resource identified by the request URI. The purpose of this field is strictly to inform the recipient of valid methods associated with the resource. An Allow header field must be present in a 405 Method Not Allowed response. This field cannot prevent an initiator from trying other methods. However, the indications given by the Allow header field value should be followed. The actual set of allowed methods is defined by the target at the time of each request. An initiator that wishes to authenticate itself with a target (usually, but not necessarily, after receiving a 401 Unauthorized response) may do so by including an Authorization request header field with the request. The Authorization field value consists of credentials containing the authentication information of the initiator for the realm of the resource being requested. If a request is authenticated and a realm specified, the same credentials should be valid for all other requests within this realm. Responses to requests containing an Authorization field must not be cached. The Connection general header field allows the initiator or target to specify options that are desired for the current transport layer connection. DCP defines the "close" connection token for the sender to signal that the transport layer connection will be closed after the completion of the transaction. DCP devices that do not support persistent transport layer connections must include the "close" connection option in every message that takes place within a connection-oriented mode of service. Note: The Connection header refers to the transport layer connection and should not be confused with a DCP session. Connections and sessions may be closed or terminated independently of each other. The Content-Base entity header field may be used to specify the base URI for resolving relative URLs within the entity. If no Content-Base field is present, the base URI of an entity is defined either by its Content-Location (if that Content-Location URI is an absolute URI) or the URI used to initiate the request, in that order of precedence. Note: However, the base URI of the contents within the entity body may be redefined within that entity body. The Content-Encoding entity header field is used as a modifier to the media type. When present, its value indicates what additional content codings have been applied to the entity body, and thus what decoding mechanisms must be applied in order to obtain the media type referenced by the Content-Type header field. Content-Encoding is primarily used to allow content to be compressed without losing the identity of its underlying media type. The Content-Encoding is a characteristic of the entity identified by the request URI. Typically, the entity body is stored with this encoding and is only decoded before rendering or analogous usage. If multiple encodings have been applied to an entity, the content codings must be listed in the order in which they were applied. The Content-Length entity header field indicates the size of the message body, in decimal number of octets, sent to the recipient. Devices should use this field to indicate the size of the message body to be transferred, regardless of the media type of the entity. It must be possible for the recipient to reliably determine the end of DCP requests containing an entity body.. Note: The meaning of this field is significantly different from the corresponding definition in MIME, where it is an optional field used within the "message/external-body" content type. In DCP, it should be sent whenever the message's length can be determined prior to being transferred. Any response message which must not include a message body is always terminated by the first empty line after the header fields, regardless of the entity header fields present in the message. If the message uses the media type "multipart/byteranges", which is self-delimiting, then that defines the length. This media type must not be used unless the sender knows that the recipient can parse it; the presence in a request of a Range header with multiple byte-range specifiers implies that the recipient can parse multipart/byteranges responses. The Content-Location entity header field may be used to supply the resource location for the entity enclosed in the message. In the case where a resource has multiple entities associated with it, and those entities actually have separate locations by which they might be individually accessed, the target should provide a Content-Location for the particular variant which is returned. In addition, a target should provide a Content-Location for the resource corresponding to the response entity. If no Content-Base header field is present, the value of Content-Location field also defines the base URL for the entity. The Content-Location value is not a replacement for the original requested URI; it is only a statement of the location of the resource corresponding to this particular entity at the time of the request. Future requests may use the Content-Location URI if the desire is to identify the source of that particular entity. If the Content-Location is a relative URI, the URI is interpreted relative to any Content-Base URI provided in the response. If no Content-Base is provided, the relative URI is interpreted relative to the request URI. The Content-Type entity header field indicates the media type of the entity body sent to the recipient. The Date general header field represents the date and time at which the message was originated having the semantics of dcpDate. If a message is received via direct connection with the initiator (in the case of requests) or the target (in the case of responses), then the date can be assumed to be the current date at the receiving end. Targets must include a Date header field in all responses. Initiators should only send a Date header field in messages that include an entity body, as in the case of the event request, and even then it is optional. A received message which does not have a Date header field should be assigned one by the recipient if the message. In theory, the date should represent the moment just before the entity is generated. In practice, the date can be generated at any time during the message origination without affecting its semantic value. The format of the Date is an absolute date and time as defined by dcpDate. The Event-Subscription request header field must be included in event requests. It provides information regarding the subscription to the event. subscriptionSegment = "Fired" | "Expiring" | "Expired"
When the purpose of the request is to indicate that the associated event was fired, the "FIRED" subscription segment must be used. When a subscription is timing out, the publisher may notify the subscriber with an event request and include the Event-Subscription header with the "EXPIRING" subscription segment. The subscriber may respond with a 202 (Keep-Alive) or 203 (Release) response to direct the publisher on how to handle the aging subscription. If the subscription has already expired, the publisher should use the "EXPIRED" subscription segment. The If-Changed-Since request header field is used with a get method to make it conditional: if the requested variant has not been changed since the time specified in this field, an entity will not be returned from the target; instead, a 300 (Not Changed) response will be returned without any message body. If the request would normally result in anything other than a 200 (OK) response, or if the passed If-Changed-Since date is invalid, the response is exactly the same as for a normal GET. A date which is later than the target's current time is invalid. If the variant has been changed since the If-Changed-Since date, the response is exactly the same as for a normal GET. If the variant has not been changed since a valid If-Changed-Since date, the target must return a 300 (Not Changed) response. Note that If-Changed-Since times are interpreted by the target, whose clock may not be synchronized with the initiator. Note that if an initiator uses an arbitrary date in the If-Changed-Since header instead of a date taken from the Last-Changed header for the same request, the initiator should be aware of the fact that this date is interpreted in the target's understanding of time. The initiator should consider unsynchronized clocks and rounding problems due to the different encodings of time between the initiator and target. This includes the possibility of race conditions if the resource has changed between the time it was first requested and the If-Changed-Since date of a subsequent request, and the possibility of clock-skew-related problems if the If-Changed-Since date is derived from the initiator 's clock without correction to the target's clock. Corrections for different time bases between initiator and target are at best approximate due to network latency. The Initiator-Agent request header field contains information about the initiator agent originating the request. This is for statistical purposes, the tracing of protocol violations, and automated recognition of initiator agents for the sake of tailoring responses to avoid particular intiator agent limitations. Although it is not required, initiator agents should include this field with requests. The field can contain multiple product tokens and comments identifying the agent and any subproducts which form a significant part of the initiator agent. By convention, the product tokens are listed in order of their significance for identifying the application. The Last-Changed entity-header field indicates the date and time at which the origin target believes the variant was last changed. The exact meaning of this header field depends on the implementation of the origin target and the nature of the original resource. For documentation, it may be just the last time the document was changed. For object properties, it may be the last time the property was set or changed. For virtual objects, it may be the last time the internal state changed. An origin target must not send a Last-Changed date which is later than the target's time of message origination. In such cases, where the resource's last change would indicate some time in the future, the target must replace that date with the message origination date. An origin target should obtain the Last-Changed value of the entity as close as possible to the time that it generates the Date value of its response. This allows a recipient to make an accurate assessment of the entity's change time, especially if the entity changes near the time that the response is generated. DCP targets should send Last-Changed whenever feasible. The Location response header field is used to redirect the recipient to a location other than the request URI for completion of the request or identification of a new resource. The Location header is used with 301 (Session Redirected) responses to specify an alternate location for the current session and that any further requests made within the session should be done using the alternate location. This allows the target to specify another port or host for processing the remainder of the session. The alternate location must be given by the Location response header field. The Retry-After response header field can be used with a 503 (Service Unavailable) response to indicate how long the service is expected to be unavailable to the initiator. The value of this field can be either a dcpDate or an integer number of seconds (in decimal) after the time of the response. The Session general header field must be included in all requests. It provides information regarding the session in which the request will take place. This Session header field may also be used in the response to indicate what will happen to the session after the transaction. If the "closing" session segment is used in the response, then closing of the session is mandatory and may not be negotiated. sessionSegment = "Closed" | "Closing" | "Open"
When a session is timing out, the target may notify the initiator with any valid request by including the Session header with the "Closing" session segment. The initiator may respond with a 202 (OK, Keep-Alive) or 203 (OK, Release) to direct the target on how to handle the aging session. If the session has already timed out, the target should use the "Closed" session segment. The Session-ID general header field must be included in all requests. If a Session-ID header is not present in a request, the target should assign the request a sessionId. The Session-ID header must be included in all responses as well. Sessions apply to both connection-oriented and connectionless modes of service and should not be considered the same as a connection. Sessions are identified by the session ID. All transactions that take place within the session must carry the session ID with them via the Session-ID header. This provides a way of grouping transactions together and keeping track of them. The Subscription-Port request header field must be included in subscribe requests when the desired port for the receipt of the corresponding event message differs from the default port number. The Target response header field contains information about the software used by the origin target to handle the request. The field can contain multiple product tokens and comments identifying the target and any significant subproducts. The product tokens are listed in order of their significance for identifying the application. Note: Revealing the specific software version of the target may allow the target to become more vulnerable to attacks against software that is known to contain security holes. Target implementers are encouraged to make this field a configurable option. The Transaction-ID general header field may be included in any request to give a unique identifier to each request. If the target supports transaction IDs, it should include the identical header and ID in any response pertaining to the request. This will allow the initiator to link up responses with corresponding requests. This is especially useful in a connectionless modes of service. It is also useful in connection-oriented modes of service when responses are broken up into multiple responses and when requests are pipelined to the target. The Transaction-Type request header field may be included in a request when the default transaction type is not desired. A response message may be explicitly prevented by including the Transaction-Type request header with "Open-Loop" as its value. By including the Transaction-Type request header with "Closed-Loop" as its value, the initiator is explicitly requesting that a response be returned. type = "Open-Loop" | "Closed-Loop"
The WWW-Authenticate response header field must be included in 401 (Unauthorized) response messages. The field value consists of at least one challenge that indicates the access authentication scheme(s) and parameters applicable to the request URI. WWW-Authenticate: Basic realm = "DcpWorld"
Initiator agents must take special care in parsing the WWW-Authenticate field value if it contains more than one challenge, or if more than one WWW-Authenticate header field is provided, since the contents of a challenge may itself contain a comma-separated list of authentication parameters. DCP makes use of special request header fields and response status codes for managing sessions. Sessions may be managed explicitly and implicitly, friendly and unfriendly, and as an initiator or as a target. The semantics for the various methods of opening and closing sessions follow. Either party makes a request against the other. The request must carry the Session message header with a value of "Open" and, optionally, the Session-ID message header with a valid uniqueId. The target responds with a 200 OK or 201 OK, Pending status code followed by the Session-ID message header. If the request had a valid uniqueId, then the target must assign the same uniqueId to the Session-ID message header and process the transaction. If there was not a valid uniqueId present, then the Target must assign one and process the transaction. The target may associate the transaction with an already active session. If the request had a valid uniqueId that corresponds to an active session between the two resources then the target must associate the request with the session (rather than opening a new session) and process the transaction. Note: If for any reason the target wishes to refrain from processing the transaction because of the uniqueId identified by the Session-ID message header in the request or due to an inability to open a session, the 402 Session Error response status code should be used. Either party initiates a request against the other which does not include Session message header. If the request did not include a valid uniqueId, then the target must create a session, assign a uniqueId to the Session-ID message header and processes the transaction. The target may associate the transaction with an already active session. If the request included a valid uniqueId that does not correspond to an active session, then the target must create a session, assign the unrecognized uniqueId to the Session-ID message header and process the transaction. If the request included a valid uniqueId that corresponds to an active session, then the target must associate the request with the session (rather than opening a new session) and process the transaction. Either party makes a request against the other followed by the Session message header with a value of "Closing" and the Session-ID message header with corresponding uniqueId. If the target wishes to close, it processes the transaction and responds with a 200 OK, 201 OK, Pending or 203 Release status code followed by the Session-ID message header with corresponding uniqueId. If the target wishes to remain open, it processes the transaction and responds with a 202 Keep-Alive status code followed by the Session-ID message header with corresponding uniqueId. Note: There is not a friendly method for closing a session as a target. However, after the target completes a transaction, it may generate a request against the other party and close the session in a friendly manner as an initiator. Either party makes a request against the other followed by the Session message header with a value of "Closed" and the Session-ID message header with corresponding uniqueId. The target processes a transaction and responds with a 200 OK, 201 OK, Pending or 203 Release status code followed by the Session-ID message header with corresponding uniqueId. The target processes a transaction and responds to a request with the 203 Release status code followed by the Session-ID message header with corresponding uniqueId. For requests that do not carry the Session message header. For requests that do not carry the Session-ID message header. For requests that carry the Session message header with a value of "Closed" or "Closing". The initiator should consider that the session is closed after the transaction is complete. 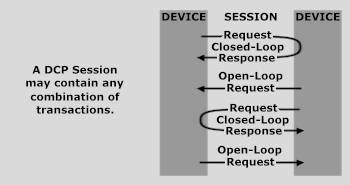 When an initiator does not wish to keep a session open after a transaction, the request should contain the Session message header with a value of "Closing". When a response includes a 203 Release status code, the initiator should treat the session as closed. When a response includes a 202 Keep-Alive status code as a result of a friendly initiator close, the initiator should keep the session open. When an initiator "times-out" an idle session, it should perform a friendly initiator close. When making a request, include the Session message header with the appropriate value for the desired treatment of the session. When making a request, include the Session-ID message header with corresponding uniqueId. Targets should only use the 202 Keep-Alive status code as necessary. When requests include the Session message header with a value of "Open", the target should assume that the initiator wishes to keep the session open after the transaction. When requests include the Session message header with a value of "Close" or "Closing", the target should assume that the initiator wishes to close the session after the transaction. For responses to requests that did not carry the Session message header. For responses to requests that did not carry the Session-ID message header. Targets should use the appropriate response status code to appropriately represent their needs in conjunction with the Session-ID message header with corresponding uniqueId. DCP provides a simple challenge-response authentication mechanism which may be used by a target to challenge a initiator request and by a initiator to provide authentication information. It uses an extensible, case-insensitive token to identify the authentication scheme, followed by a comma-separated list of attribute-value pairs which carry the parameters necessary for achieving authentication via that scheme. The 401 (unauthorized) response message is used by an origin target to challenge the authorization of a user agent. This response must include a DCP-Authenticate header field containing at least one challenge applicable to the requested resource. The realm attribute (case-insensitive) is required for all authentication schemes which issue a challenge. The realm value (case-sensitive), in combination with the canonical root URL of the target being accessed, defines the protection space. These realms allow the protected resources on a target to be partitioned into a set of protection spaces, each with its own authentication scheme and/or authorization database. The realm value is a string, generally assigned by the origin target, which may have additional semantics specific to the authentication scheme. A user agent that wishes to authenticate itself with a target-- usually, but not necessarily, after receiving a 401 response--may do so by including an Authorization header field with the request. The Authorization field value consists of credentials containing the authentication information of the user agent for the realm of the resource being requested. The domain over which credentials can be automatically applied by a user agent is determined by the protection space. If a prior request has been authorized, the same credentials may be reused for all other requests within that protection space for a period of time determined by the authentication scheme, parameters, and/or user preference. Unless otherwise defined by the authentication scheme, a single protection space cannot extend outside the scope of its target. If the target does not wish to accept the credentials sent with a request, it should return a 403 (forbidden) response. The DCP protocol does not restrict applications to this simple challenge-response mechanism for access authentication. Additional mechanisms may be used, such as encryption at the transport level or via message encapsulation, and with additional header fields specifying authentication information. However, these additional mechanisms are not defined by this specification. Proxies must be completely transparent regarding user agent authentication. That is, they must forward the WWW-Authenticate and Authorization headers untouched, and must not cache the response to a request containing Authorization. DCP does not provide a means for a client to be authenticated with a proxy. A widely used authentication scheme is the Basic Authentication Scheme. The "basic" authentication scheme is a form of access authentication that is based on the model that the user agent must authenticate itself with a user-ID and a password for each realm. The realm value should be considered an opaque string which can only be compared for equality with other realms on that target. The target will authorize the request only if it can validate the user-ID and password for the protection space of the request URI. There are no optional authentication parameters. where "DcpWorld" is the string assigned by the target to identify the protection space of the request URI. To receive authorization, the initiator sends the user-ID and password, separated by a single colon (":") character, within a base64  encoded string in the credentials. The basic authentication scheme is a non-secure method of filtering unauthorized access to resources on an DCP target. It is based on the assumption that the connection between the initiator and the target can be regarded as a trusted carrier. As this is not generally true on an open network, the basic authentication scheme should be used accordingly. In spite of this, initiators should implement the scheme in order to communicate with targets that use it. This section is meant to inform application developers, information providers, and users of the security limitations in DCP as described by this document. The discussion does not include definitive solutions to the problems revealed, though it does make some suggestions for reducing security risks. As mentioned, the Basic authentication scheme is not a secure method of user authentication, nor does it prevent the entity body from being transmitted in clear text across the physical network used as the carrier. DCP does not prevent additional authentication schemes and encryption mechanisms from being employed to increase security. The writers of initiator software should be aware that the software represents the user in their interactions over the Internet, and should be careful to allow the user to be aware of any actions they may take which may have an unexpected significance to themselves or others. In particular, the convention has been established that the get and subscribe methods should never have the significance of taking an action other than retrieving information. These methods should be considered "safe." This allows user agents to represent other methods, such as set, event, tether and call, in a special way, so that the user is made aware of the fact that a possibly unsafe action is being requested. Naturally, it is not possible to ensure that the target does not generate side-effects as a result of performing a get request; in fact, some dynamic resources consider that a feature. The important distinction here is that the user did not request the side effects, so therefore cannot be held accountable for them. A target is in the position to save personal data about a user's requests that may identify their patterns of DCP usage. This information is clearly confidential in nature and its handling may be constrained by law in certain countries. People using the DCP protocol to provide data are responsible for ensuring that such material is not distributed without the permission of any individuals that are identifiable by the published results. Like any generic data transfer protocol, DCP cannot regulate the content of the data that is transferred, nor is there any a prior method of determining the sensitivity of any particular piece of information within the context of any given request. Therefore, applications should supply as much control over this information as possible to the provider of that information. Two header fields are worth special mention in this context: Target and Initiator-Agent. Revealing the specific software version of the Target may allow the Target object to become more vulnerable to attacks against software that is known to contain security holes. Implementers should make the Target header field a configurable option. The information sent in the Initiator-Agent field might conflict with the user's privacy interests or their site's security policy, and hence it should not be transmitted without the user being able to disable, enable, and modify the contents of the field. The user must be able to set the contents of this field within a user preference or application defaults configuration. Implementations of DCP origin targets should be careful to restrict the data returned by DCP requests to be only that that was intended by the target administrators. If an DCP target translates DCP URIs directly into object calls, the target must take special care not to serve deliver that was not intended to be delivered to DCP initiators. For example, Unix, Microsoft Windows, and other operating systems use ".." as a path component to indicate a directory level above the current one. On such a system, an DCP target must disallow any such construct in the request URI if it would otherwise allow access to a resource outside those intended to be accessible via the DCP target. Similarly, data intended for reference only internally to the target (such as access control data, configuration data) must be protected from inappropriate retrieval, since they might contain sensitive information. Welcome to the DCP XML Document Type Definition. XML is a data format for structured document interchange on the Web. It is called the "extensible markup language" because it is not a fixed format like HTML. XML is designed to enable the use of SGML on the World Wide Web. XML is not a single markup language: it is a metalanguage that allows an author to design a markup language. A regular markup language defines a way to describe information in a certain class of documents (for example, HTML). With XML, authors can define their own customized markup language for many classes of documents. These customized languages are defined by a Document Type Definition file or DTD. The DCP Specification includes an XML Document Type Definition for DCP. It can be used to describe device information such as properties, events and object models. Please note that the architecture of DCP exhibits the abstraction of device data from the protocol itself. As such, use of this DTD with DCP is not required. All that is required is that the recipient of the representation be able to understand and process it. For your reference, the XML DTD follows should you wish to use it.